The Sunday Million, the world’s biggest weekly poker tournament, could be about to get bigger when it reduces its buy-in from $215 to $109 from January 27. The popular Sunday tournament will retain its flagship status, its million-dollar guarantee and its six-figure first prize whilst becoming more accessible to players with smaller bankrolls. Players will have the same starting stack, the event will have the same start time, and you'll still be able to re-enter. But the buy in will be $109, down from $215. Why the change to $109? The plan is simple. PokerStars wants to open online poker's flagship event to more and more players. The lower buy-in will do that, while ensuring the "Milly" remains the Sunday Major every player wants to win. The PokerStars Sunday schedule has always had the players in mind. Events like the $22 Mini Million and the $11 Sunday Storm have proven immensely popular. Meanwhile the new High Roller Club has quickly become a place for high stakes players to play. 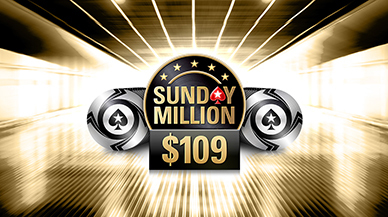 The new look Sunday Million sits within those changes, offering thousands more players a chance to play and win a six-figure payday in the biggest event of its kind. That could mean a few changes in the structure to eliminate more people in the middle stages, and it could mean deepening play in the later stages. While the buy-in changes, the $1 million guarantee, which after all gave the tournament its name remains exactly the same. First prize will also be more than $100,000 every week. The plan is simple. Hike up the rake % hope stupid people don't notice.